Installation Summary / History: Brannon is on the management team at RackSpace hosting here in San Antonio. He was referred to us by a local Toyota Dealer. 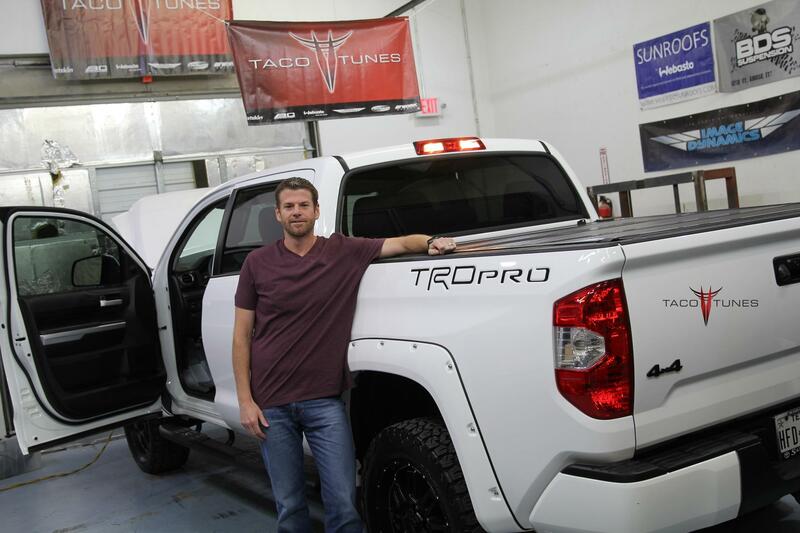 Brannon came to us with high expectations for his brand new 2017 Toyota Tundra TRD Pro. He was aware he would be upgrading the stock stereo. Below you will find a detailed listing of all the parts we used in the installation. We also included some pictures of the 12″ subwoofer next to 10″ subwoofer and a shallow mount 12″ subwoofer. 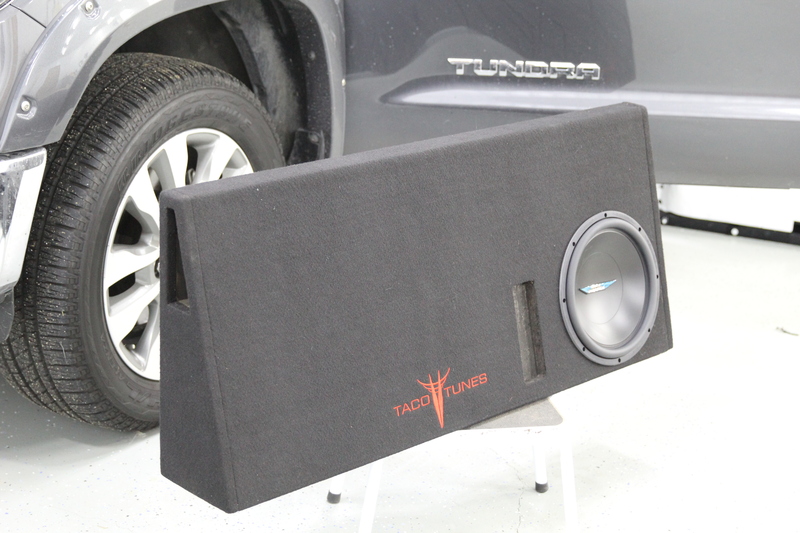 Typical Installation time is 1 day, however we matted the front, rear doors and the rear wall behind the subwoofer. If we are matting the truck we keep the truck for two days. One audio installation and matting jobs are possible, but require at least 14 hours with the truck. The AMP is hidden under the driver seat. Sound Processor (ReCurve EZQ) is hidden under rear set. The full size Image Dynamics 10” subwoofers fit behind the rear seats. The entire truck appears to be stock and makes the truck appear to e stock and less likely for break ins. 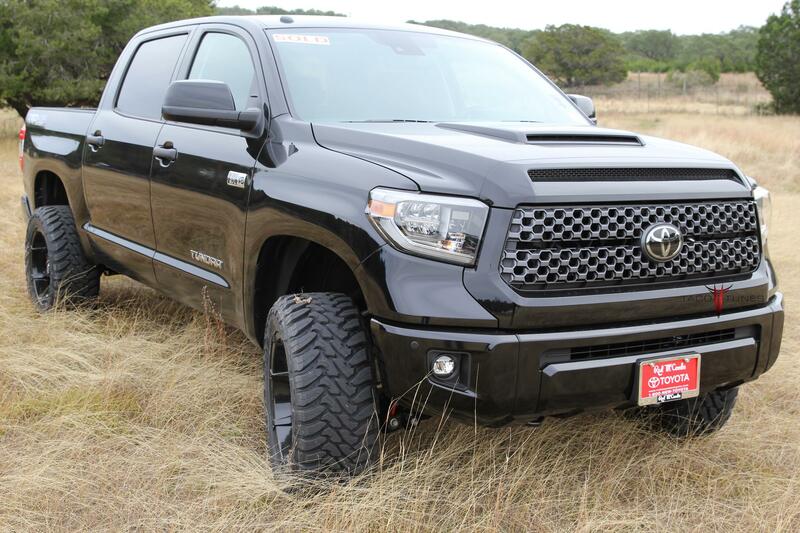 Additionally, the gear is setup for Toyota’s so chances of theft are greatly reduced. Ballistic Matting 4 x Doors & Rear Wall takes 9 sheets to complete Tundra – Standard bulk pack includes 9 sheets. Installation Summary / History: Guy lives in a town a bit north of San Antonio. 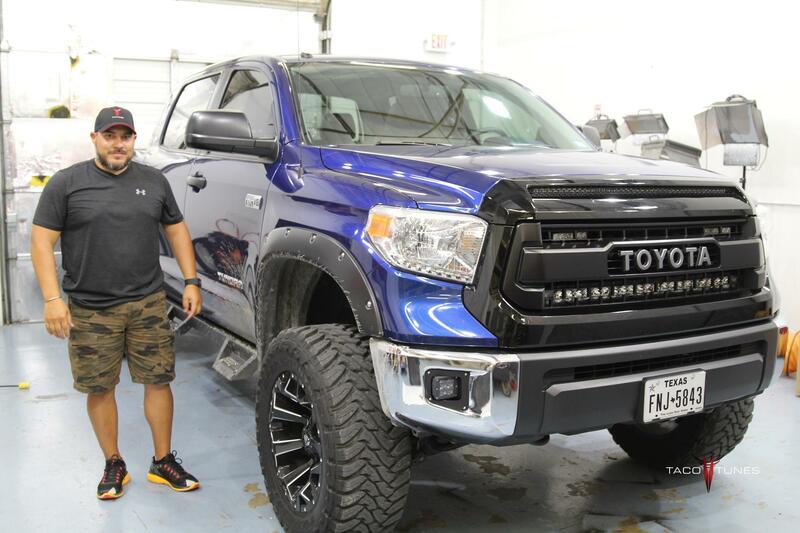 He paid a local audio shop to upgrade the audio in his 2016 Toyota Tundra CrewMax 1794 Edition. After 3 visits to the same shop and another large shop here in San Antonio with no luck, he found our website. He came in for a system evaluation. Unfortunately, we see the scenario quite often . “Professional installation” shops doing a horrible job on the installation on JBL equipped Tundras. 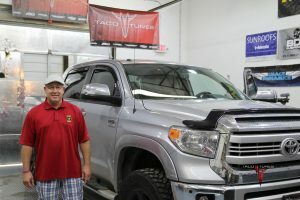 This is probably the 15th Tundra we have repaired or assisted in repairing here at our location in San Antonio. When Guy came in, 2 of his door speakers were not working and the system was popping and turning off / on. The system sounded worse than the stock JBL setup. We gave him a quote and he said he would have to think about it. 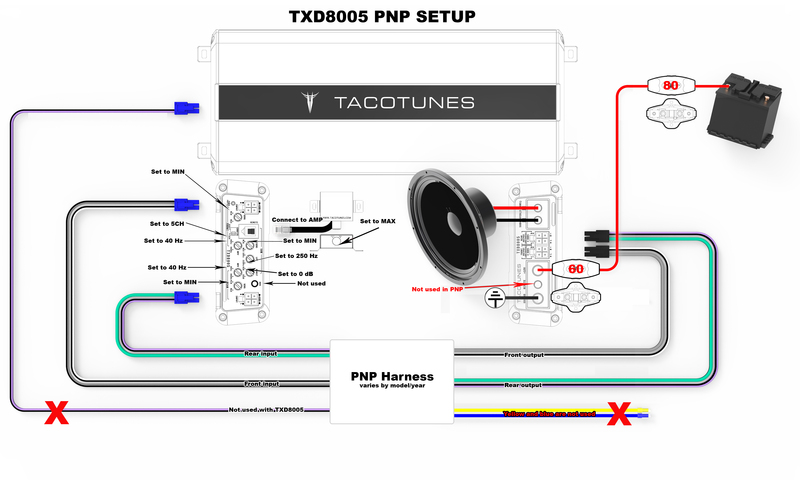 We recommended that harness system be repaired and replacing the speakers and sub(s). Pretty much a re-do. Guy called us back and said please get this fixed. Before we could start installing a new system, we had to repair the damaged JBL wiring system. The previous shop did not leave enough of the stock wiring to work with. We had to create a new harness and solder back to original stock wiring. In the pictures below you will see the repair process. Guy loves audio in his truck. He had systems in his trucks since back in his high school days. He was pretty much dancing when he left the shop. Before pictures of bad installation performed by a local audio shop. Jon drove up from ATX to get his stereo system completely upgraded here in our Shop. 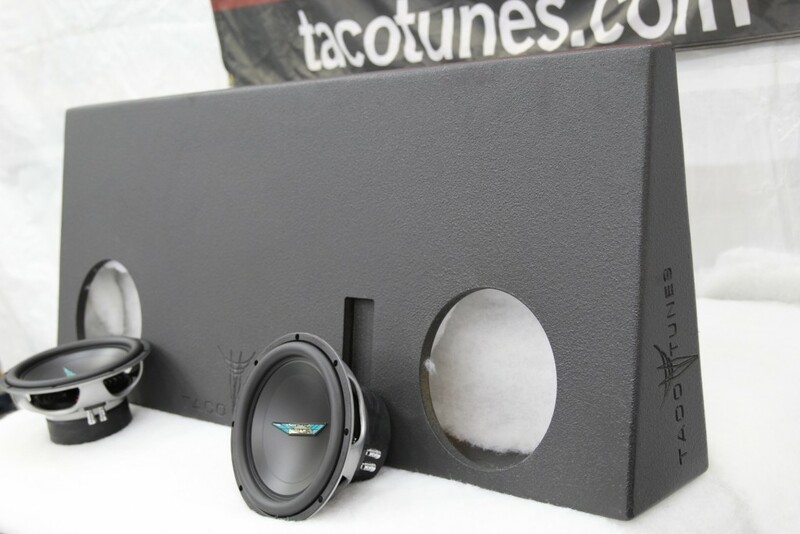 Thank you for purchasing the tacotunes.com system 1x complete audio upgrade. 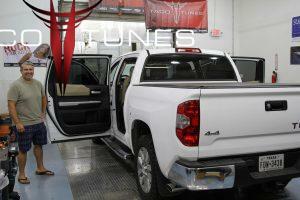 This system will allow you to keep your stock head unit and utilize your existing wiring system in your Toyota Tundra. 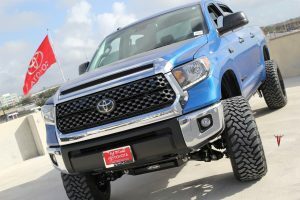 thus making it easier to return your truck back to stock if you choose to sell or trade your truck. Be sure to save ALL your stock parts. Remove dash speakers / tweeters and center speaker if equipped. You can leave them unplugged and in place, but we recommend leaving them unplugged during and after you have completed your install. JG has had audio systems in most of his vehicles. As you can see by the smile on his face, he was very happy with the results. Juan grew up installing his own audio systems. He came to us with high expectations. He wanted to hear our demo system before he pulled the trigger. After listening the SQ1 package, he opted to upgraded to the dual 12″ SEALED box. This is with the FULL size subwoofers, not shallow mounts. Juan listens to a lot of different music and wanted something that would play slip knot to old Metallica to today’s hip hop.